" I Conquered Asperger's and now help others." JEREMY Samson, 30, turned his tough childhood experience into a learning program for autistic kids. "As a kid, I had trouble understanding sarcasm or jokes. Mum would say, ‘It's raining cats and dogs,' and I'd respond, ‘No, it's not – I don't see cats or dogs falling from the sky.' Sometimes the curious way my brain worked got me into trouble. A boy would say, ‘Hey, see that brick? Throw it at that car.' I'd do as I was told and afterwards try to figure out if it was the right or wrong thing to do. I was bullied and my behaviour deteriorated so I'd do things like bang my head on the ground. Eventually, tests revealed why I found life so difficult: I had Asperger's syndrome, a form of autism. Mum and Dad were brilliant. They ensured teachers were informed and encouraged me to do drama and sport to build confidence and coordination. I had a diet free of sugar, gluten, wheat and food colouring and was placed on an exercise program developed in the US to help with multitasking, cross-pattern movements and fine motor skills. I left school able to fit in and grateful to those who'd helped me appreciate my uniqueness. It inspired me to find a profession that helped others be their best, so I became a personal trainer. At 18, it was hard getting enough clients so I also worked as a gym membership consultant. One day, a couple asked if there was any chance of signing their 12-year-old son Toby up to the gym. He was a bit overweight but too young to join the gym so they asked if I knew how to help him. "He has Asperger's," they added. "Oh, so do I," I said as I continued taking notes and serving people. They watched me multitasking, something Aspies [people with Asperger's] usually struggle with, clearly taken aback. "Can you help us?" they asked. I said I'd give it a go. I took Toby to a local oval, where I coached him through a program that incorporated exercises I'd done as a kid, plus extras like eye-hand coordination and memory training. I made them challenging but fun and within two months his movements, balance and coordination were improving. He told me it had changed his life – he felt more confident, he fitted in at school better and his concentration had improved. He also liked having a role model who has Asperger's. I realised I was onto something and when Fitness First heard about it they agreed to let me use their gyms for my programs. Today, I have 15 Asperger's children aged eight to 15 on my books, another 10 on a waiting list and I teach at four centres around Melbourne. I also have three DVDs, so the kids can practise the movements at home. 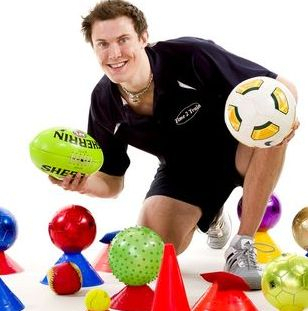 My Time 2 Train program reached the attention of Australian Asperger's expert Professor Tony Attwood, who told me it could have great benefits not only in terms of emotion management and fitness – Asperger's children often appear clumsy and uncoordinated, so they tend to avoid sport – but also in clarity of thoughts and concentration. I believe it works because the kids see that I'm doing so well. No one would guess I have Asperger's and struggled as a kid. I tell the children I work with, "Sometimes life doesn't go so well, but if you can have control of what you're doing, you'll find it a lot easier." "Training with Jeremy gave me confidence"
Jeremy's first client, Toby Boulton, is now 17, in Year 11 and studying for his VCEs, and hoping for a career in web technology. He says his two years of training with Jeremy helped him in many ways: "I got fitter and lost weight, of course, but it also helped my confidence. I was able to talk to people and look them in the eye, and I fitted in better at school. Now no one would know I have Asperger's. Jeremy Samson, 30 of Vermont developed ‘Time 2 Train’, a program to help assist all ages with autism through exercise and personal training, which travels to local communities, interstate, internationally to assist families in areas that do not have access to beneficial programs. Time 2 Train has travelled internationally to showcase the program and create awareness of the importance of exercise. 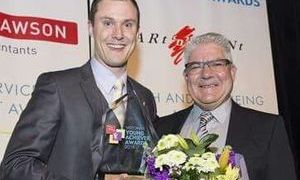 Jeremy is the current Australian Ambassador for Aspergers Victoria and was awarded winner for "Entreprenuer" in Edinburgh, Scotland for the 2014 ANCA Awards and third place for ‘Performing Arts’ at the 2015 Naturally Autistic People Awards in Canada.